The sonnet was written by Emma Lazarus, American poet, in 1883. The poem was engraved on a bronze plaque and mounted inside the lower level of the pedestal of the Statue of Liberty in 1903. " There are several styles available among the Paperpastries Round Letter Seal Rubber Stamps. Before beginning, later this week on Thursday, March 28, the 2019 Major League Baseball season begins! We are looking at the Paperpastries “confections for your correspondence” Etsy Shop Round Letter Seal Rubber Stamps – with each one pricing at $12 plus applicable shipping. 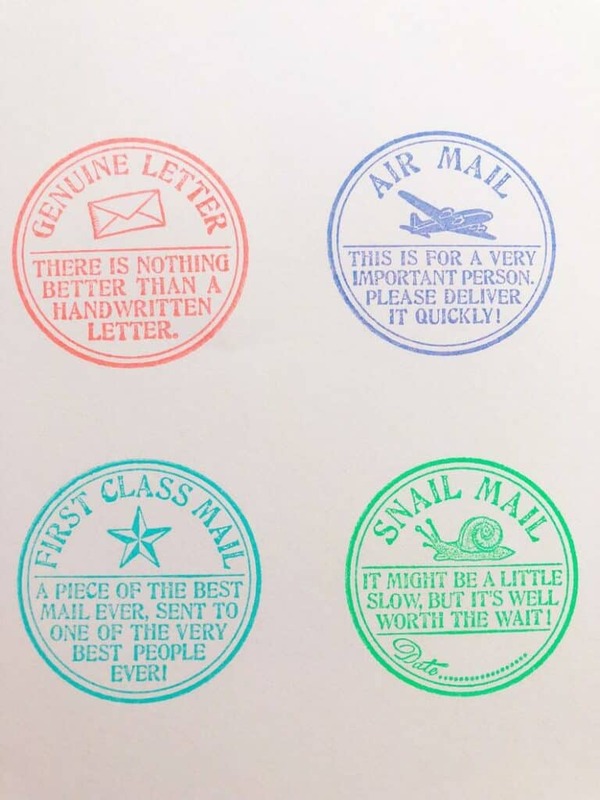 The uniqueness of the different rubber stamps celebrating letter writing is fantastic! It is appearing there are three styles for choosing when ordering. 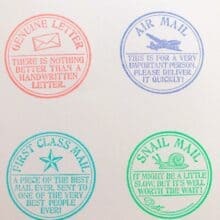 The round rubber stamps celebrating letter writing I’m seeing available are for “Genuine Letter“, “Air Mail“, and “Snail Mail“. Furthermore, the “First Class Mail” style is not appearing in the pull-down menu for ordering. For my new Pen Pals met during InCoWriMo 2019 who are “nearby” to them, perhaps a road trip for you to visit them is an option! “Paper Pastries is a small stationery studio and shop located in los angeles. In addition to our ready made line, that you’ll find here in the shop, we a lso offer custom design for everything from invitations and social stationery, to birth and moving announcements. As we wrap up, one of my previous posts was on Paperpastries Greetings From State Rubber Stamp (9-17-2017). I have been thoroughly enjoying the State rubber stamp for North Carolina, so I’m confident these are wonderful to use too! In fact, my order is already in process for the “genuine letter seal” style! P.S. Today is blog post #1489! The countdown to AnchoredScraps #1500 daily blog posts continues!